The Israeli Embassy was full of blue and white balloons, and a falafel bar was stationed at the back of the room. What better way to send off Americans to Israel? Last Thursday, Nefesh B’Nefesh and the Jewish Agency held a farewell celebration in honor of the 250 people making aliyah from the Mid-Atlantic region. Once past security, a lively gathering was waiting inside the embassy. The program started a little later than scheduled, preparing the guests for the Israeli way of life. As guests took their seats, Israeli ambassador Michael Oren and his wife Sally took the stage to say a few words. Both the ambassador and his wife made aliyah around thirty years ago, meeting six months after she arrived. “The day he got out of the army, I made aliyah,” she explained. “We met six months later, and one year later we married.” It was always Oren’s dream to be the Israeli ambassador and having been “devoted Zionist youngsters,” the transition was relatively easy for him. Sally ended her speech by wishing the evening’s guests a “nesiyah tovah and hatzlacha rabbah,” a good trip and lots of luck. The program proceeded with a video from Jewish Agency chairman Natan Sharansky and a few more speakers. Meanwhile many of the guests continued to prepare for the Israeli way of life by chatting in the back of the room. 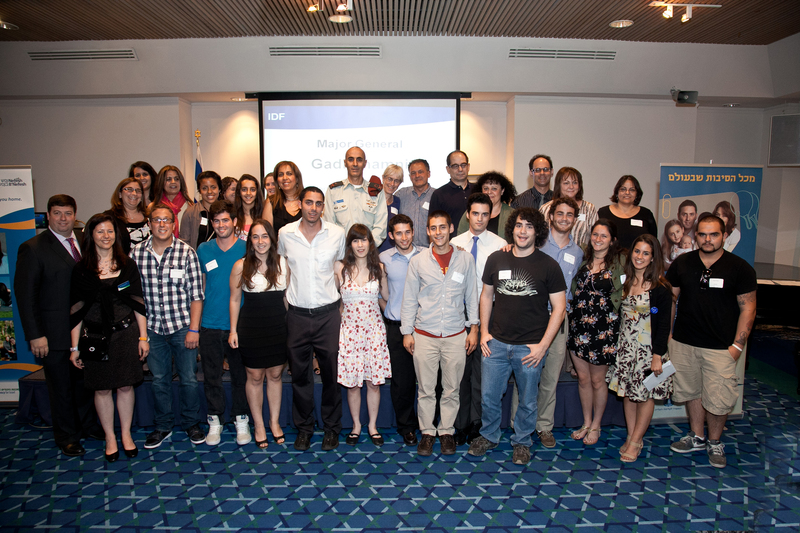 After the speakers were finished, those making aliyah were called up to be photographed. The first group called up was Gar’in Tzabar, young Americans who were planning on enlisting in the Israeli Defense Forces. Of the 250 people making aliyah from the region, 140, or 55 percent, are between the ages of 18 and 35. Some are joining the IDF, while others will be attending ulpan to hone their Hebrew skills. One such individual, Arella Mayer, explains that she didn’t see an alternative to making aliyah: “It was a question of when, not if.” Mayer is in fact making chazarah, or returning to Israel. Born in America, Mayer and her family made aliyah when she was five months old. At the age of10, her family returned to America, but Mayer knew she would return. After graduating from the University of Maryland, Mayer was ready to return to Israel and join the IDF. While she doesn’t know exactly what she’ll be doing in the army, she wants to “defend American values of democracy” in Israel in whatever way possible. After studying Holocaust Studies at Maryland, Mayer felt that if she could be in the position of doing something for Israel, she should do it. “It’s a privilege to be in the IDF,” Mayer says with pride. two grandchildren make aliyah several years ago. It’s an exciting experience! Really enjoyed your article, Rebecca. Keep them coming……..